Born: Jul 12, 1817 in Concord, Massachusetts, U.S.
Died: May 6, 1862 (at age 44) in Concord, Massachusetts, U.S.
Henry David Thoreau was an American poet, writer, naturalist and a philosopher. He was very famous for his works like Walden, or Life in The Woods, in the year 1854. His articles, essays, books, and poetry total more than 20 volumes. He was also known for his beliefs in civil disobedience and transcendentalism and he was a dedicated abolitionist. Henry David Thoreau was born in 1817 in Concord, MA. He was the third son for his father, John Thoreau, and mother, Cynthia Dunbar. Henry’s father was a businessman and an active member of the Concord Fire Society. At the age of 16, Henry entered Harvard College where he studied Latin and Greek grammar and composition and took classes in various subjects like philosophy, history, English and mathematics. 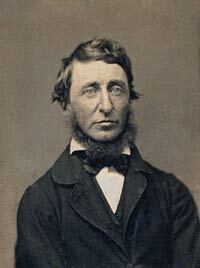 Before graduating in 1837, Thoreau also made use of the college library to enhance his knowledge. After graduation, Thoreau became a teacher in a school in Concord. However, he was dismissed from his job just two weeks after his appointment due to his refusal to give corporal punishment to the students. A canoe trip in 1839 made Henry realize that he should not continue his career as a school teacher, but instead become an established poet. He got an invitation from Ralph Waldo Emerson in 1841 and began working with him as an assistant and handyman. He also contributed articles to Emerson’s transcendentalist magazine – The Dial – during that time. Around 1845, Thoreau moved into a small house around the shores of Walden Pond. While there, he spent much of his time appreciating nature and he did a large amount of writing and reading. During the early to middle part of the 19th century, there was a transcendentalist movement that embraced new ideas in culture, religion, and literature. It was a doctrine of the Unitarian church and a protest to intellectualism. Thoreau was a member of the transcendentalism movement that existed in New England. Through his writings, he was able to impart his teachings and beliefs to people about how to live in order to transcend the present world. Thoreau became a very important member of the transcendentalist movement by using the influence of Emerson. His statements were quoted by various scholars around the world to portray his beliefs that every individual must transcend the present sociological ideals. While living in his house at Walden, Thoreau was arrested for refusing to pay poll tax. As a result, he spent a night in jail. He wrote an essay in response to the incident in 1849. It was entitled Civil Disobedience and it called for passive resistance to unjust law. Many have cited this work as being an inspiration to them, including Martin Luther King, Jr. and Gandhi. Henry David Thoreau spent nearly two years at Walden Pond and his famous literary work – Walden explained how an individual should best live to be attuned to his own nature and to nature itself. He left Walden in 1847 and resided again in Emerson’s house. After living at Walden Pond, Thoreau travelled to other various places that inspired him to write. He returned to Concord, however, and found out that he was dying of tuberculosis. After years of declining health, he died on May 6, 1862.